No, it’s not what you might think… Today is election day in the UK, so I hurried back from Brussels and made it to the polling station in good time. This blog post is not about the British general election, but in many senses our election should be about the issues raised here. 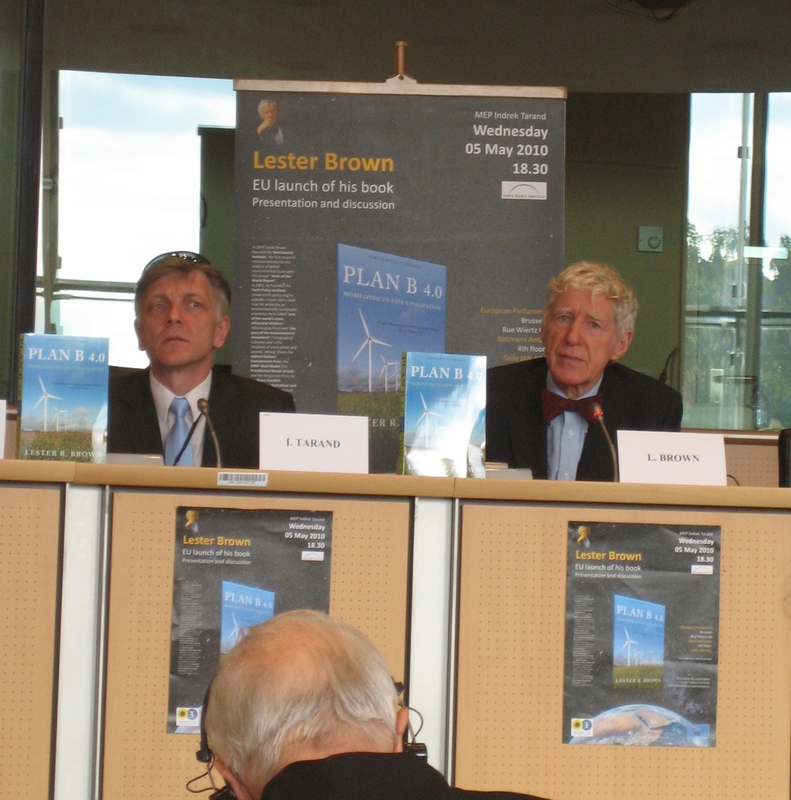 Last evening at the European Parliament in Brussels, Lester Brown, the veteran environmentalist, was launching his latest book, Plan B 4.0, Mobilizing to Save Civilization, which gives a scary account of how far down the road of environmental hooliganism we have gone, yet he remains optimistic that there is scope for action. 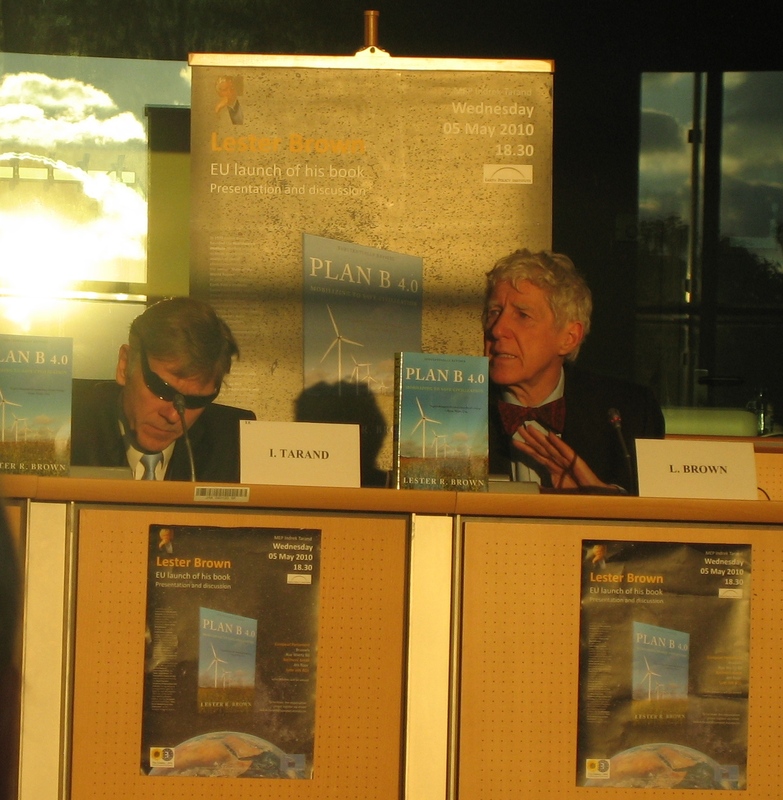 He was hosted by sun-glassed Estonian MEP, Indrek Tarand. 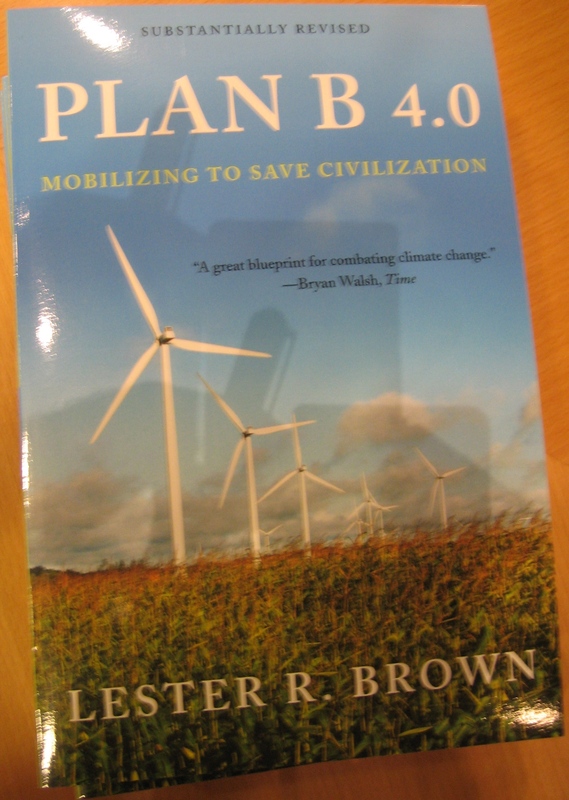 Lester Brown is credited with pioneering the concept of sustainable development, which has become such a buzzword in the green – and not so green – policy environment. At the talk yesterday, he reckoned that ‘food may be the weakest link’ and raised the spectre of food wars when the food bubbles burst. If countries – which presently rely on over pumping (non replenish-able) water for their food production – run out of water, what are they going to do to feed the people? Into the mix add the notion that the melting ice sheets and shrinking mountain glaciers are going to raise the sea level and inundate low-lying rice lands and agriculturally rich river deltas, then the number of hungry people with no place to grow food is going to increase. Lester Brown estimates that there are now one billion hungry humans on our planet. Consider that China is number one producer of wheat, followed by India and then the United States in third place. When the Chinese ask the Americans to share their grain and the latter are not so keen, the former are going to use their collateral in American bonds as leverage. Should be interesting to see what happens then. 1. Cutting carbon emissions by 80% by 2020. 2. Limiting the human population to a maximum of 8 billion people. 4. Nurturing the global economy’s natural support systems. I haven’t read the book yet, so hope I am not doing it an injustice here, but I couldn’t help feeling pessimistic about our collective capacity to change quickly enough to avert disaster for future generations. According to many, perhaps most commentators, the Copenhagen Climate Conference was a failure. The big reason is that our national and international organisations are ineffectual and only serve the vested interests of a relatively small range of stakeholders. We do not have a big global society that perceives itself as a homogeneous community with a sufficient identity of shared interests to effect coordinated change. I hope that the optimists prove us pessimists wrong, that it is not too late to mobilise to save civilisation.